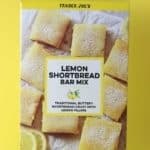 So, Trader Joe’s is many things, but basic is not one of them. 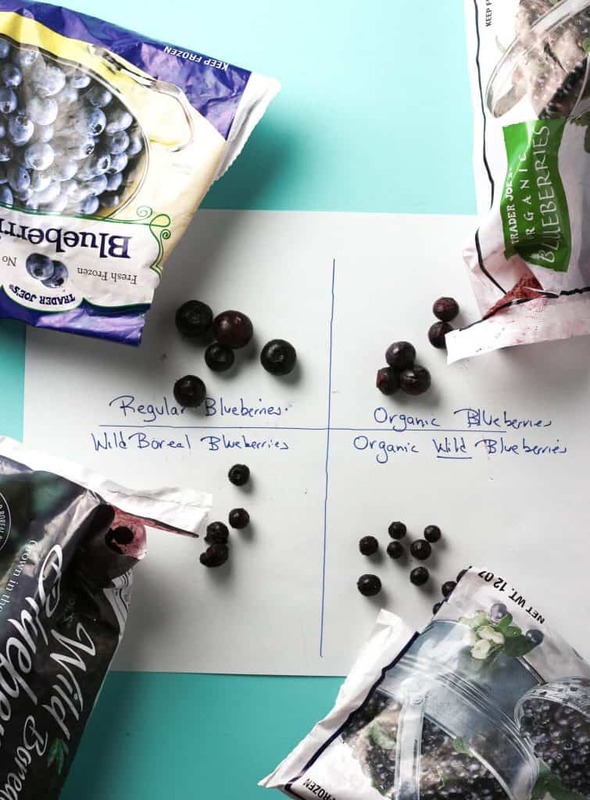 One or perhaps two blueberry varieties are common. Usually an organic and an non-organic variety is pretty standard for most grocery stores. 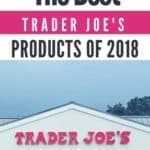 Trader Joe’s frozen blueberries come in four different varieties at four different price points. 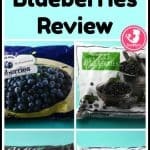 So unlike most reviews where I look at a single product , I’ll go through what to expect from this line of frozen blueberries. So what comes out of the bags and is there a difference? 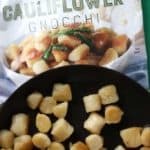 Yes, in terms of both size and flavor, these do have a large range. All come in plastic bags that are not resealable. These all range in price, size, and flavor. This bag weighs in at 12 ounces and will set you back $1.99. This bag had the largest blueberries of the bunch. 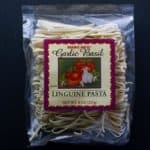 These will remind you more of the fresh variety that you might buy in the store when they are in season. This was the juicy blueberries that you would expect. 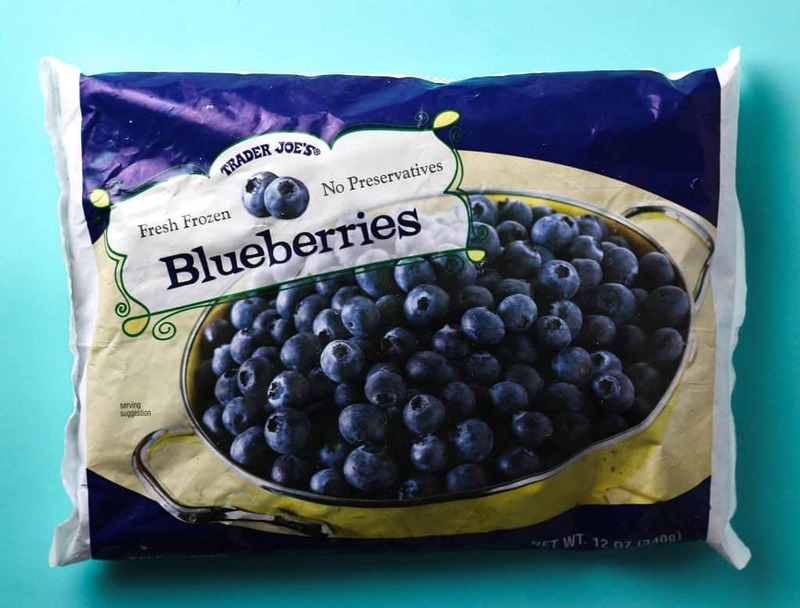 These are ideal for baking or blending as you will be guaranteed a big bite of blueberry with a hint of vanilla flavoring. 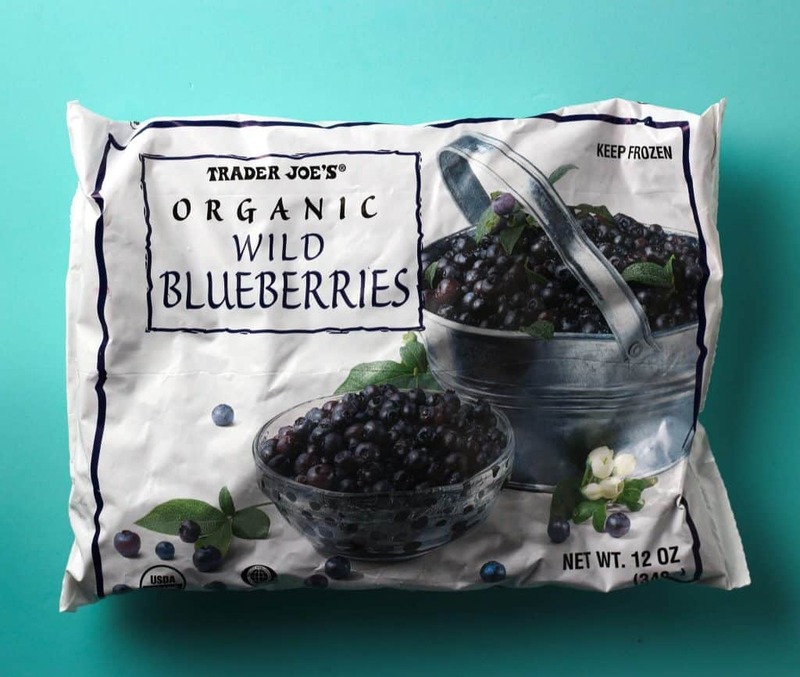 Trader Joe’s Organic Wild Blueberries will lighten your wallet the most of any of the four varieties featured. Priced at $3.49 for a 12 ounce package this is nearly double the price of either the regular or wild boreal varieties per ounce. The blueberries in the bag are very small and are tart. This bag was most similar to the boreal variety. If you are going to use these in your smoothie, then be prepared to see a lot of blueberry skin and not so much of the tender fruit that is beneath the skin. 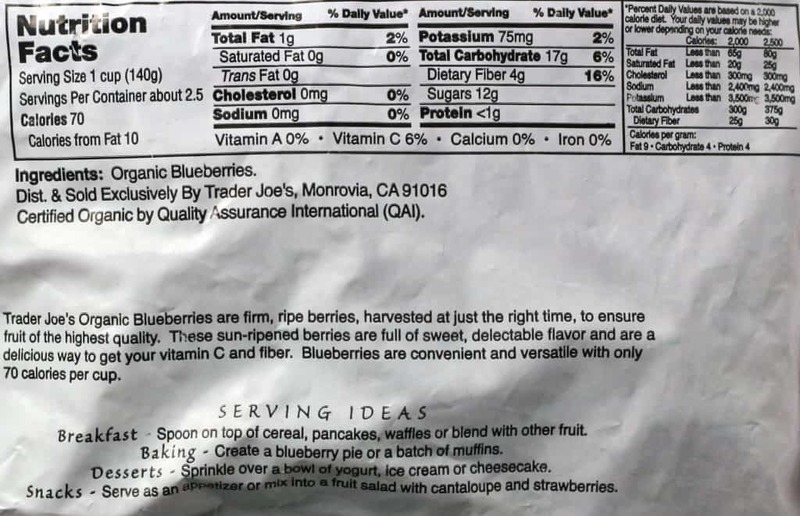 Trader Joe’s Organic Blueberries is priced at a $1 premium for having the word organic on it. In terms of taste, there wasn’t a huge difference between this and the non-organic variety. These were large blueberries, but not quite as the regular variety. This was not as tart as the wild varieties of blueberries. This was more of a fruit flavor. This will set you back $2.99 for the bag. 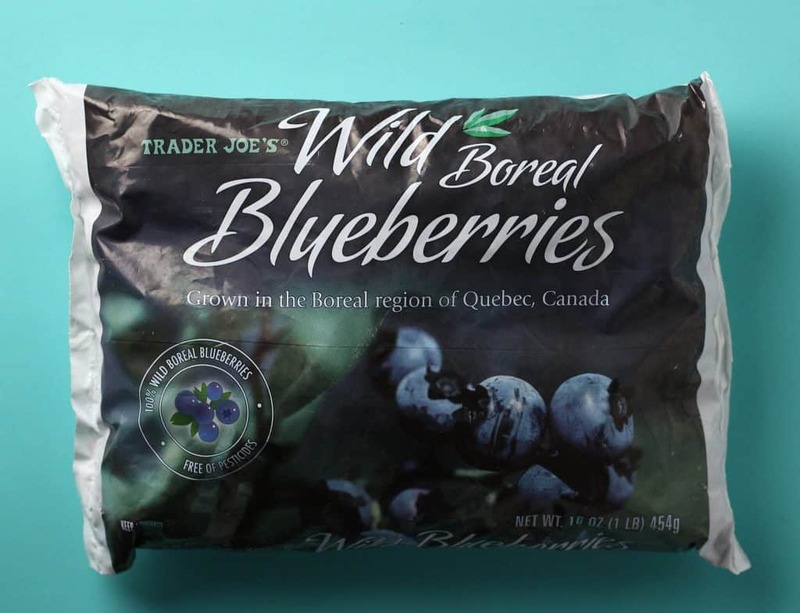 The Wild Boreal is the only one pound bag of the bunch and per ounce is actually the cheapest. The bag is $2.49. But if you’ve never had these you might be taken back by how small these are. In a smoothie, this will leave you with more skin that fruit. It will lend a strong color to anything. The fruit itself was more tart than the regular variety. Because of their smaller size, I would use these more for smoothies. If having wild and pesticide free are a priority for you, then this is an affordable item. If you are wondering if one is truly more nutritious than another, then according to the New York Times, the answer seems to be there is only a negligible difference, however there maybe more antioxidants and phytochemicals in the wild varieties. Would I buy this again? 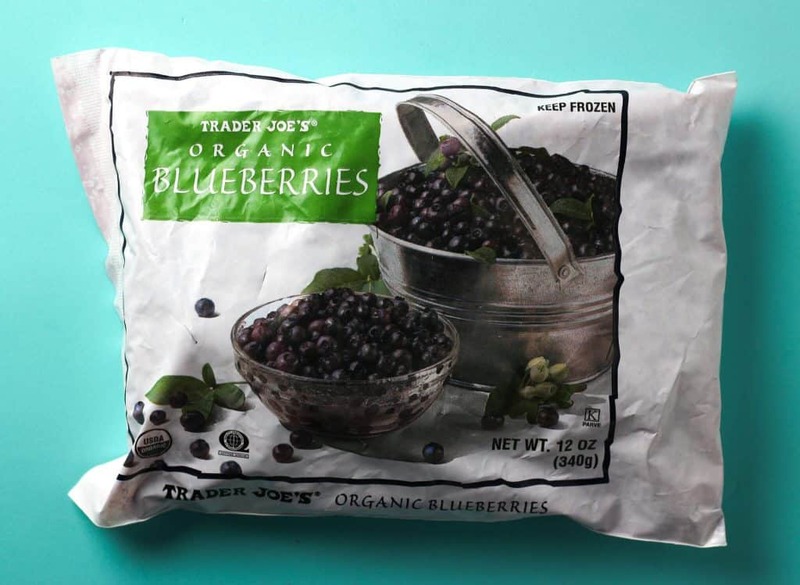 There wasn’t a bad bag in the bunch of Trader Joe’s Frozen Blueberries. 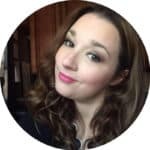 So, depending on what your priorities and budget tell you, you are safe with any of these. For me, I’d reach for the regular bag and wile boreal again. They were the most affordable of the bunch. I love blueberries! I primarily eat them as a frozen snack in the summertime. Low cal, sweet-tart, cooling…. I personally prefer the wild variety opposed to the cultivated variety for a couple of reasons. I prefer my blueberries a tiny bit more on the tart -sweet side & also because they contain a higher level of antioxidants. I researched them a bit a few years ago when I was looking for something low cal/high antioxidant to snack on. Us healthcare professionals are not always the healthiest eaters even when we know better….lol. Wild blueberries contain a significantly higher amount of the antioxidant, anthocyanin. Hey Dag! I think as a healthcare professional you guys have it rough with trying to eat healthy. I did not find much of a difference when they all got thrown into a blender for a smoothie. 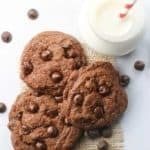 I wish a cooling snack would taste good right about now, here outside of NYC, we’re expecting snow tomorrow 🙁 Seriously, no April Fools Day joke on that one. Thanks for clarifying my info about the antioxidants! I do remember my East Coast Winters. Honestly I’d prefer snow right now opposed to rain although it just got sunny now after raining part of the day. I miss the snow. Hang in there. As long as they are measuring the snow in inches, I’m happy. As a teacher, the snow lands on my “Spring Break.” Today it was 60 degrees. Tomorrow, is snow. Hopefully it will be our last snow storm.